What’s NI Abbey Road Drummer? 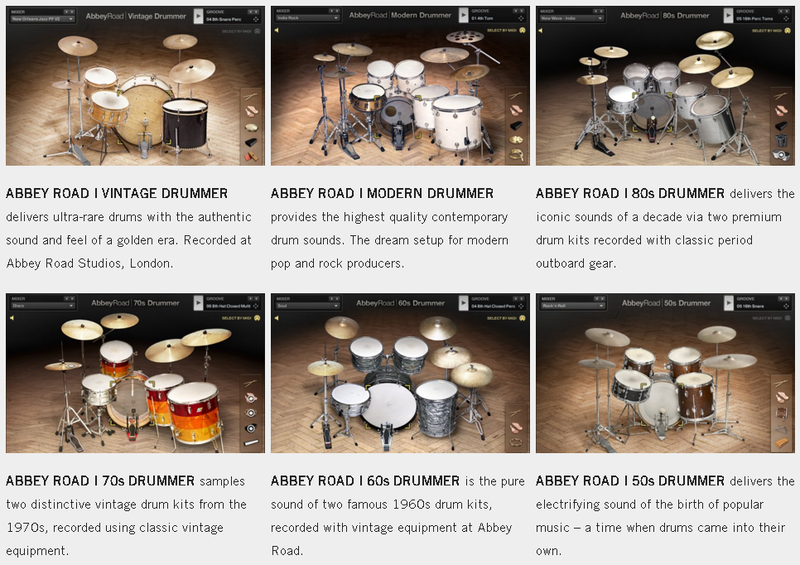 Each Abbey Road Drummer product contains two virtual drum kits typical for the time it relates to, recorded and engineered in a way that fits the styles and genres of that specific time. So, the Abbey Road Drummer product series contains in all 12 drum kits and therefore offers a fine assortment of virtual drum kits for finger drumming with the XpressPads technique. 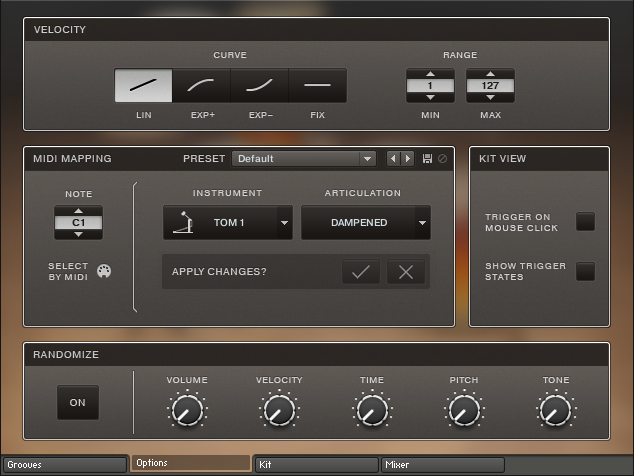 All Abbey Road Drummer products share the same intuitive user interface that is based on the Kontakt sampler engine. As this review is geared toward finger drummers, I will skip all areas of Abbey Road Drummer that relate to included midi grooves and performance controls. As a finger drummer one doesn’t need these tools, as you are able to play drum grooves and fills in realtime off the top of your head. All the Abbey Road Drummer virtual drum kits have been recorded and engineered with top-notch gear that the Abbey Roads Studios offer. So, Native Instruments was able to create the pristine drum sounds that perfectly fit the genres of music for which the virtual drum kits were made. The sound of all the Abbey Road Drummer kits is balanced and “round,” and sounds can be tweaked with the built-in effects and microphone setting controls. In all areas of virtual drum production—recording, engineering, mixing capabilities, and microphone settings—Native Instruments has taken care to present musicians with the highest possible standards, from most realistic sound to the most intuitive workflow. The Abbey Road Drummer user interface is one of the most intuitive that I have used so far. Only the most necessary controls are made available, meaning there are no extraneous bells and whistles to complicate matters. For each virtual drum kit in the Abbey Road Drummer products, there are two available editions: one “full” version that contains the complete drum sample content that the software offers, and one “lite” version that includes a limited number of drum samples, so that the CPU and RAM of the computer in use is burdened less. On the “Options” page, components like velocity curves, midi volume range, visual drum kit piece feedback behavior, kit piece selection via midi, and kit piece articulations can be set. I especially like the articulation selection feature in combination with the “select via midi” option. This makes it quick and intuitive to choose different articulations per kit piece. A set of different midi mapping presets are also available, as is the essential General MIDI layout, which is the foundation of the XpressPads Finger Drumming technique. Also, mappings for common virtual drum sets like Addictive Drums, EZdrummer, and Superior Drummer are available. Microphone settings can be adjusted right on the drum kit GUI in the lower section of the plugin. For each kit piece, it is possible to change the levels of the overhead and room mics. On the Mixer page, the volume of overhead and room microphones can be adjusted overall, in both mono and stereo. It is also possible to change, right on the drum kit GUI, the kit piece tuning, attack, hold, and decay time. 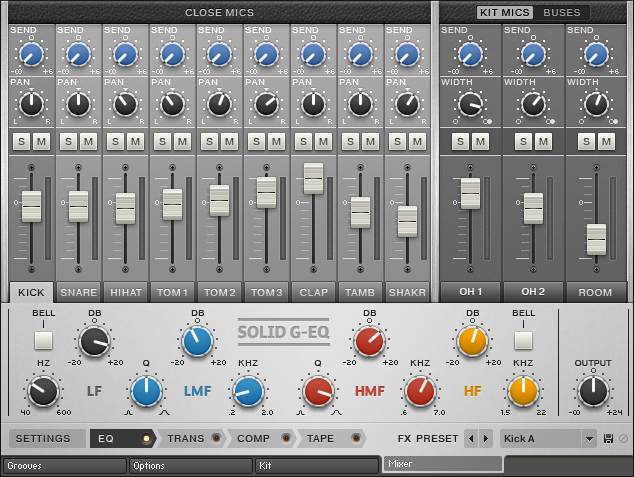 On the mixer page, the volume, panning, and send volume can be adjusted. Not only is it possible to change the most important parameters of these effects via the control knobs, it is also possible to change the effects chain, therefore re-ordering the different available effects for different sound coloration and experimenting. 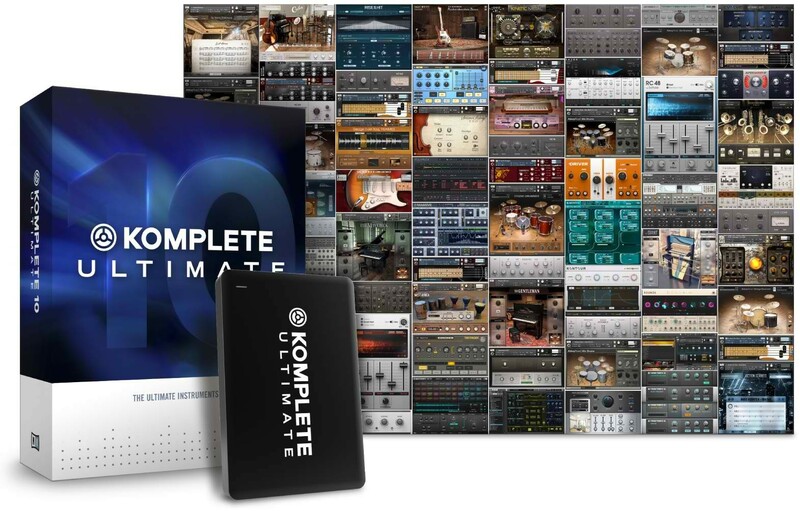 Needless to say that “Native Instruments KOMPLETE Ultimate ” is a phenomenal collection of music production tools and virtual instruments at an amazing discount. However, I should note that compared to several other virtual drum software products, ALL Abbey Road Drummer products are contained in one package. Native Instruments KOMPLETE Ultimate contains more than 75 virtual instruments and effects products, ranging from band sounds, cinematic / orchestral sound libraries, synthesizers, sound design and mixing tools, as well as effects processors. Overall, this bundle contains more than 17,000 sounds that can be utilized in all areas of music. The 440 gigabytes of software come on a dedicated hard drive for easy and quick installation. I recommend Native Instruments KOMPLETE Ultimate to anyone seriously interested in finger drumming, producing music, and working with virtual instruments and effects. Beginners in particular can save a lot of money with this bundle in the long run because it renders it unnecessary to buy other pieces of software later on. The Abbey Road Drummer product family is a comprehensive collection of top-notch virtual drum sets. They all sound fantastic and are easy to use. All styles of music that require acoustic drum sounds are covered by Abbey Road Drummer. One downside is the long load time, which is a side effect of the huge drum sample content that comes with Abbey Road Drummer. That might not be an issue if working with SSD drives, but with conventional 7.200 rpm hard drives, it can take up to a minute for a complete Abbey Road Drummer “full” kit to load into RAM, even though the “direct from disk” streaming technology doesn’t load the complete sample content to RAM at once. If it would load more quickly, Abbey Road Drummer would share top-billing in my list of the three best virtual drum sets alongside Addictive Drums 2 and even above EZdrummer 2 . If you’d like to offer feedback on this Native Instruments Abbey Road Drummer review, use the “comments” section below or the video commenting functions on YouTube or Google+. We’re interested in your thoughts and your experience. If you found this Native Instruments Abbey Road Drummer review helpful and consider purchasing the product, we’d appreciate it if you’d use the below Amazon link. It does not cost anything additional, but that action helps us keep up the work that we do in order to bring finger drumming to the people. Many thanks in advance!